Such was the merry go round and the exodus of players from Leyton Orient last season when over 40 players were used in the first team that we look at some of the players over the summer who will be wearing an O’s shirt in this new season. Last season you could be excused as an Orient fan for chanting ‘We Want Our Money Back’. This season though it’s all change down at Brisbane Road with chants of ‘We Want Our Mooney Back’ and that’s exactly what happened as David Mooney is Back With Leyton Orient. He was the first signing from the new regime as they bought striker Mooney back to the club following his release from Southend United. The Irishman spent four years at O’s from 2011 to 2015 in his first spell, but is back for a second stint after penning a two-year deal. Everything changed on June 30th 2017 with Orient now in the 5th tier of English football in the National League as contracts were terminated and a new squad assembled. Goalkeeper Charlie Grainger was one of the first to put pen to paper on a new two year deal at Brisbane Road and Orient fans welcomed the former England Under 18 player back into the fray. O’s fans will be pleased Sam Sargeant the 19 year old shot stopper thrown in at the deep end last season is still with the club. 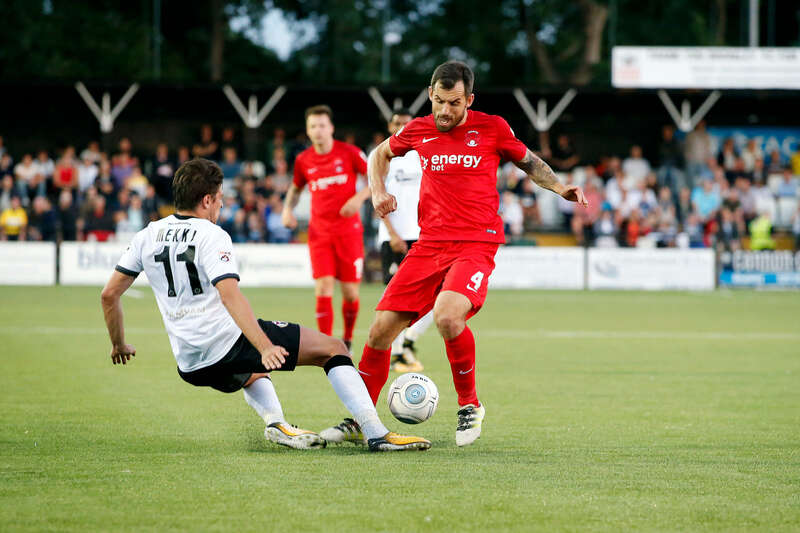 The Greenwich man played 15 games for Orient last season in harrowing circumstances but was professional throughout and this season he will give Charlie Grainger a good run for his money. What’s happening at the back? On 4 July 2017, preceding his release from National League side Woking, Jake Caprice signed to the O’s on a two-year deal. The 25 year old defender was previously with Crystal Palace, Bolton and St. Mirren. Joseph Widdowson joined the club also on a two year deal on July 1st. The former Grimsby, Dagenham and Redbridge, Rochdale and Northampton star was born in Forest Gate and started his career at West Ham United but sadly failed to make the grade. The defender is 28 years old and went straight into the starting line up this season. After failing to agree a new deal at Colchester, Orient stepped in to bring George Elokobi, a 31 year old to the club. A big bustling defender in the old style, Elokobi was an unused substitute for the Cameroon national team. He rose to prominence when he played 85 games for Wolves between 2008 and 2014, helping to take them into the premier league before being loaned out to Nottingham Forest and Bristol City. He later had a decent run for Oldham Athletic before moving to Colchester United. He’s a great acquisition for the club, powerful and sturdy. Huge Centre back Josh Coulson, Orient have brought in on loan from Cambridge United. The 6 foot 3 giant is 28 years old and played over 270 games for the club in the city where he was born winning the FA Trophy and gaining promotion to the football league as well. It’s a 6 month loan and O’s fans will be hoping he can help achieve the same status for Leyton Orient at the first time of asking. Jamie Sendles-White has come in from Swindon Town, sort of. The 23 year old defender played 15 times for town last season but announced in May that he would leave Swindon in June when his contract was up. He put pen to paper on August 1st on a one year deal and will be looking to make his mark in the National League. Despite being born in Kingston Upon Thames (we’ve all got our cross to bear) he has played for Northern Ireland at Under 19, Under 20 and Under 21 level. Dan Happe the 18 year old defender from Tower Hamlets who played a couple of games last season is still in the squad while former Norwich City, Crystal Palace and Crawley Town man Christian Scales is also back up for Orient as the 20 year old signed a two year deal last month. Midfielder Alex Lawless who was released by Yeovil makes his way to Orient on a two year deal along with Romauld Boco the full Benin international who comes in from Accrington Stanley. While looking to partner David Mooney up front will be Macauley Bonne the Zimbabwe Under 23 international signed on a two year deal.